Irrigation is critical for every kind of landscaping, and in Tucson’s dry climate, it’s an even more important issue. There are multiple irrigation types to consider, and picking the right one for your property will help you conserve the maximum amount of water while keeping your landscaping healthy. Two common irrigation systems are drip irrigation and sprinkler systems. Here is a look at how these systems compare, so that you can choose the right one for your space. Drip irrigation, or drip line systems, use small amounts of water directed specifically at the roots of plants. With drip irrigation, there is an irrigation line that with small holes spaced out across the line. The holes release drips of water in targeted spots. The benefit of this kind of irrigation is that uses water efficiently, since it is applied directly to the roots, and since only a small bit of water is used at a time, it reduces two major sources of water waste: runoff and evaporation. This kind of irrigation is also helpful in areas with awkward shapes that are easily overshot by traditional sprinkler systems. Despite the benefits, drip irrigation systems do have a few cons. For large areas, the number of drip lines that need to be used can be excessive, and they can end up posing tripping hazards in the yard. They can also interfere with mowing, since you can’t run lawn mowers over the lines. Sprinkler systems feature embedded sprinkler heads strategically placed throughout the landscaping. They run on a timer and deliver water for a predetermined amount of time. 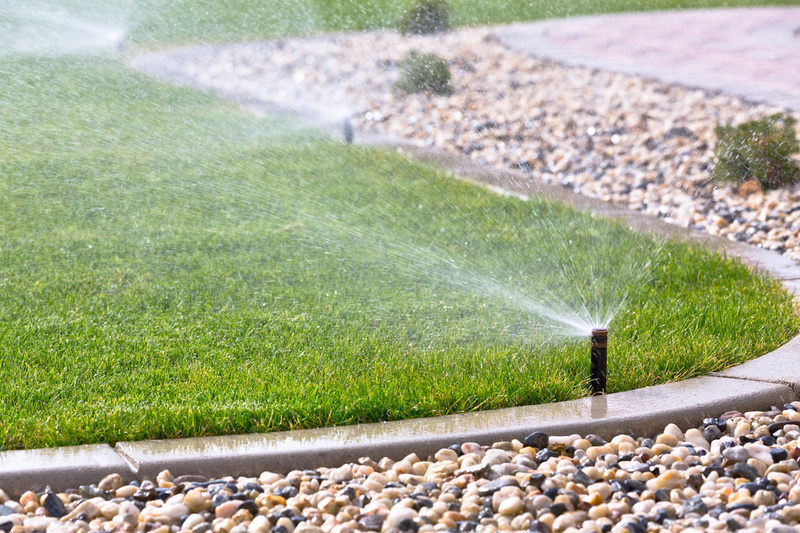 Sprinkler systems are good for large areas, but because of the amount of water they deliver, some of it will be lost to runoff and evaporation. Sprinklers can also overshoot plants and parts of the lawn, so those areas may not receive the water that they need. Let Complete Landscaping help you select a cost-effective and efficient way of watering your landscaping to keep it looking its best. You can speak to a landscaper in Tucson today by calling (520) 323-8918.